The Mary Sue had a cool post today asking readers, “Who Is Your Favorite Superhero, and Why?” to which I — naturally — wrote a love letter to Black Canary. I figured I should save it for posterity, so here is a fresh post on this long-neglected blog. Happy 70th Anniversary, Dinah. You are THE BEST. Black Canary, hands down. I imprinted on the 70s Hard-Traveling Heroes version and her Justice League appearances and solo backup stories in various books at that time but I also had some Golden Age stories that were collected in the 80-Page-Giants and loved those, too. She’s tough, a great fighter, kind, a good detective, sometimes had a cool superpower, rode around on a motorcycle, and wasn’t the -girl version of anyone. She also didn’t become a hero because of tragedy — she wanted to fight crime and so she did in the only way available to her at the time (1940s), and she used her smarts and her skills to even save the Justice Society. From the late 80s/early 90s up until Jordan Gorfinkle paired her with Oracle and created the Birds of Prey, she was kind of a lost character, rarely well-written, but BoP revived her for modern readers and Gail Simone’s run especially really redefined her in a way that somehow made use of nearly all the previous decades of character history. 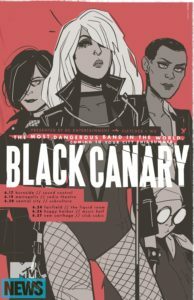 Shout-out to the recent (post New-52) and much-lamented-by-me Black Canary series which I thought was a brilliant take on the character and really engaged with and deconstructed the Golden Age Dinah Drake roots of the character in a way no one had done before. This year is her 70th anniversary. And I expect she’ll still be my favorite when it’s her 100th.